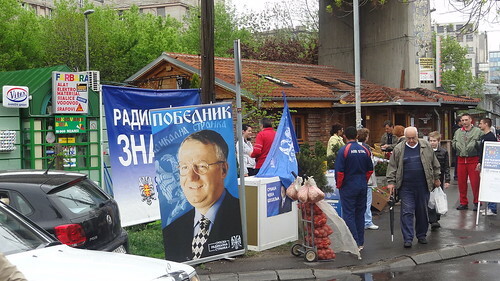 Saturday morning we were at the Green Market in Senjak and we heard the patriotic music and saw the banners and tables of the Serbian Radical Party. The Serbian Radicals are led by the man pictured in the banner, Vojislav Šešelj. Šešelj is currently at the Hague under trial for war crimes since 2003. He is one of the founders of the party, which started just before the break-up of Yugoslavia. The Radicals are a very successful, far right party in Serbia. In the last elections in 2008, they won almost 30% of the seats in the National Assembly, and their candidate in 2008, Tomislav Nikolić, barely lost to Boris Tadić, winning 48% of the vote. I think for this election, Šešelj’s wife is running in his stead, as Nikolić formed his own party. They also have a candidate in the mayor race, a young man named Nemenja Šarović. They were handing out literature and in the song I heard, was praising Šešelj for his patriotism. The Radicals run on a platform of avoiding integration to the EU and instead, seeking closer ties with Russia. They are also against globalization and are looking for the Serbian populations in neighboring countries to join Serbia proper. In perusing the literature, they were selling professor Šešelj’s books (he is a former professor at the University of Michigan) and showing evidence of how EU membership has not been beneficial to the small, Eastern European countries who already joined. I am not sure how they will do in the election next month. As a neutral observer, I am not sure the name “radical” is the best name to have for a political party. Sure they are radical, or revolutionary in not wanting to join the EU, but in English, the word also means “extreme” and I am not sure if that is the best way to get independent or “swing” voters. I also don’t know what effect having their leader at the International Criminal Tribunal for the Former Yugoslavia for the past 9 years has on the party. I don’t think there is an equivalent in US politics, as the Tea Party doesn’t have such different views from the mainstream Republican party. It will be interesting to see how the Radicals do in this election. Although I cannot vote because I am not Serbian, I am curious to see how my views match up with various parties in the election. Maybe my Serbian readers can help me match which party most resonates with my opinions. 1) Of course as an educator, I believe education of young people should be the number one priority of a nation. I would set the goal for the best-trained teachers and best facilities of any schools in the Balkans. This would go from nursery schools to universities. 2) Erase the labyrinth of laws that inhibit starting and ending businesses in Serbia. 3) Integration Question – This is a hot topic here. I propose re-forming Yugoslavia first, before trying to get into the EU. Seek first strong economic ties and then eventually a reforming of the country of Yugoslavia. The similarities between the countries is a natural fit and 22 million makes it a strong country in Europe that would have some clout on the world stage. 4) Kosovo – Cut Serbia’s losses and go for as much of the north as possible, even going as far as a population exchange. The southern half of Kosovo would go to Albania (which would join my re-created Yugoslavia eventually). Kosovo is too small and too disorganized to be an independent country. Of course this would be predicated on protection of Serbian monasteries and Field of the BlackBirds as heritage sites. 5) Other economic issues – The pensions are a big burden on the Serb government, but a committment that needs to be completed. Try to cut corruption and tax the super rich. Income disparities and too much power in the hands of a few are bad for the nation. This is also a problem in the US. I am not sure how to lower the unemployment rate and give hope for young people graduating universities. This is a tough problem. I would lower the sales tax (VAT) and raise income and property taxes. That is about all I can think of for now. I don’t mean to offend anyone and am writing this post in the spirit of the exchange of ideas. I don’t have enough time to really feel strongly about politics, but I find it an interesting way to understand Serbia, my adopted home for now. I’m Serbian and I totaly agree with your political opinions and I think that your priorities are perfectly ranked. Especially 1 as the youth is the future of the country and 2 as there is alot of foreign companies interested investing in Serbia. Serbia has alot of potential but it just needs new thinking, maybe you should run for President?